Grab a sample pack for your cat today. The original Cat Wine made by Apollo Peak lets you share a glass of wine with your cat, and is now in Australia! Made from all natural ingredients and completely non-alcoholic, these wines will give your cat a natural high. All Apollo Peak cat wines are derived from organic natural ingredients, freshly sourced and made with love. Actual alcohol is bad for cats! Cat wine is a special blend of ingredients and catnip, which can give your cat a natural high. Grab a glass of pinot noir, then paw your kitty a dish of Pinot Meow, and spend some quality time with your furry friend! Great drink, great company and with more than fifty percent of cats likely to be affected by catnip your kitty could be in for a real treat! A fine feline snack, the original cat wine, made with organic red beets, and of course catnip. For the discerning feline, made with organic red beets and infused with peppermint and catnip. Fancy a white wine? 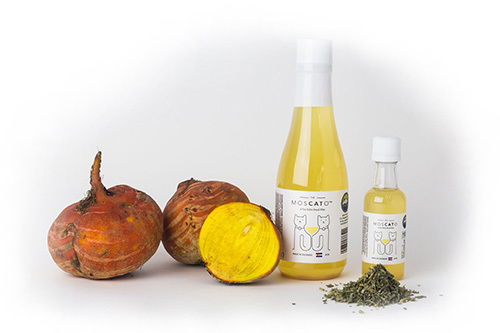 Your cat can accompany you with this blend of organic yellow beets and catnip. A light rosé colour, made with organic yellow beets, catnip and infused with valerian root, this cat wine ages from light pink to white. Not sure if your cat will love it? Spoil yourself and your cat, have a drink together. For the purrfect night in.